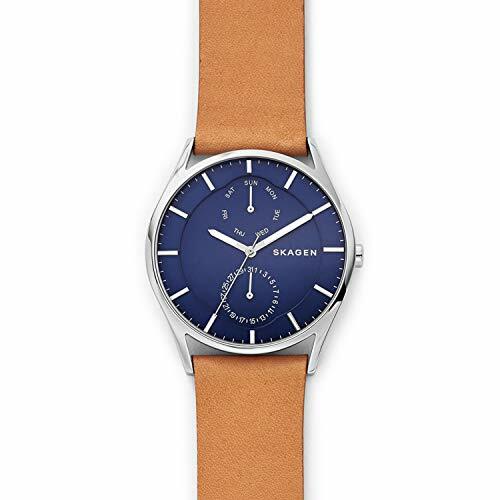 Skagen have been making watches for quite a few decades now, and their designs are simple and minimalistic. After all, what else would you expect from a Danish inspired watch company? This booming fashion brand was actually started by a couple from New York who were inspired by living in Denmark. They based their designs on what they were seeing around them, and used Danish clock makers to help get them started. After that, things quickly took off. They have since expanded all over the globe and into other fashion accessories, getting bigger over time. They got so big in fact that Fossil noticed them, and bought them, and they are now part of their overall portfolio of companies. 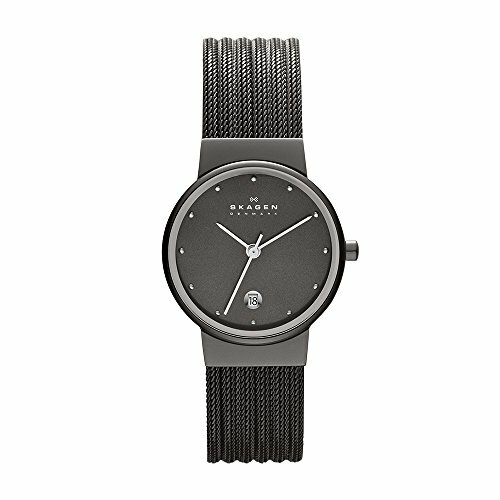 Skagen still stick to their original design principals and create stunning, simple and minimal watches that scream “Bauhaus” (at least to me) through and through. After all, that is what Bauhaus was all about back in the early 1900s. 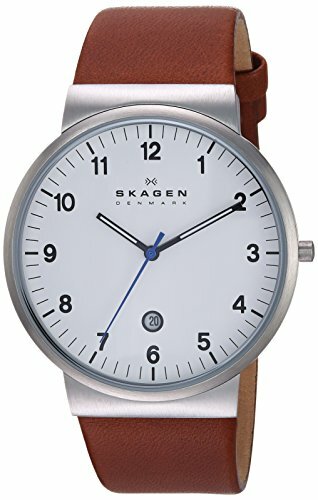 As part of a major manufacturer, Skagen still get great ratings and reviews from owners, so even though their prices are very reasonable, the quality has not suffered. Of course, this is still primarily a fashion brand so you won’t find complex automatic movements or superb Swiss engineering. You get what you pay for. 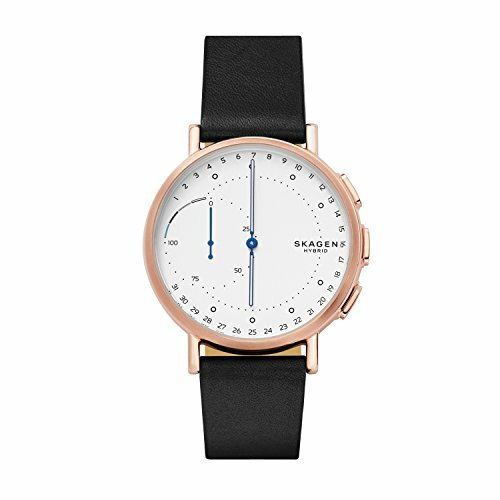 The Skagen Sundby is very reminiscent of the Bauhaus simplicity with the clear and large Arabic numerals around the dial and square stubby hands. Skagen have also added a subtle but still legible date window at 6 o’clock, along with a useful 24hr inner ring of markers, for those who work in any industry with 24 hour time (or Europe for that matter). I also love the clean and bright blue dial, which pops from the dull metallic gray of the case and strap. The overall quality is fairly run of the mill for a watch with a simple quartz movement, 30m water resistance and a mineral crystal. However, the use of titanium for the case, and a stylish mesh strap make this watch stand out a little from its peers. Note: There is also another model, the Grenen (in the second picture) which is all gray, if that is something you prefer. If you want to go even more minimilstic and Bauhaus, then the Archer is the model for you. Its simple white face with black numbering and markers is Danish design to a tee. And subtle addition of the blue second hand is typical of other Bauhaus watch companies like Nomos, who often use it on the hour and minute hands too. 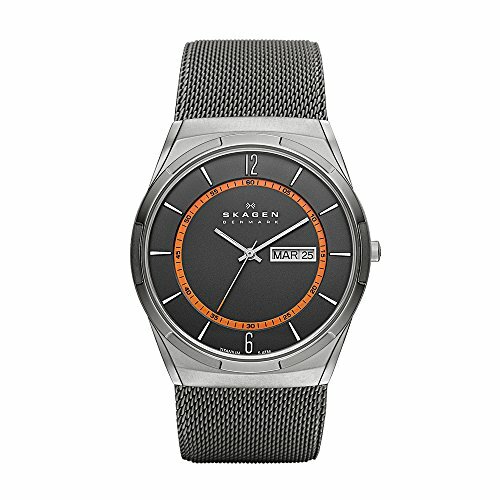 Skagen have still managed to sneak in their 6 o’clock date window and another nice touch at the lugs with the square stainless steel pieces. The crown is also almost invisibly small, which might make for a challenge when setting this watch. Another stylish version of the Ancher model comes with a vertically aligned, 3 sub-dial chronograph with clean and large pushers next to the crown. The dial is a clean gun-metal with recessed sub-dials with a more reflective background. The hands and markers stand out well with a rose-gold style finish. The thick leather band matches the whole style well and it’s easily changed for any other 20mm band you might have in your collection. 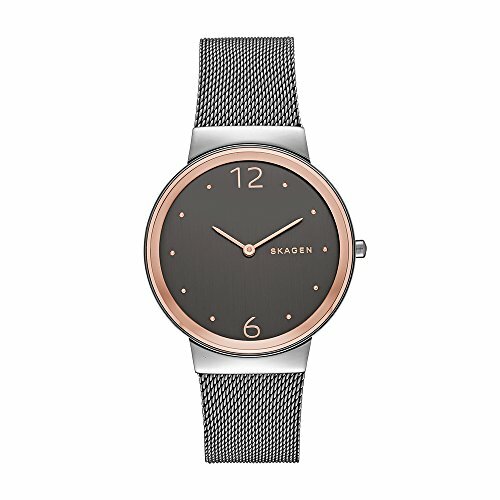 Something a little more unique is the Melbye model from Skagen. Sure, it has a simple gray dial with only 2 numerals (at 6 and 12 o’clock). Of course, it has clean silver hands and a day date window at 3 o’clock. But it has a stand-out bright orange inner second ring which is truly unique. The rest of the specs are standard Skagen with a quality Titanium case, Quartz movement and stainless steel mesh strap. It’s compatible with most phones too, via a handy smartphone app: Android OS 5.0+, iPhone 5/iOS 9.0+. 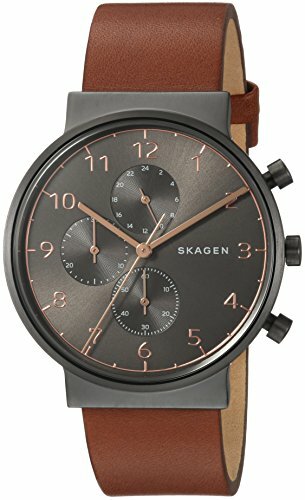 Skagen’s Holst model is the last men’s model I want to cover. It has enough unique elements on the dial, I thought it was worthy of this final spot. The deep blue dial with applied baton hour markers and pointed, lumed hands make for a striking look. Add to that the recessed inner dial with the day/date sub-dials and the Skagen branding, and this watch seriously stands out from its brethren. The light calfskin leather band is a final touch of class on this watch, sitting cleanly between the lugs with a 22mm width. 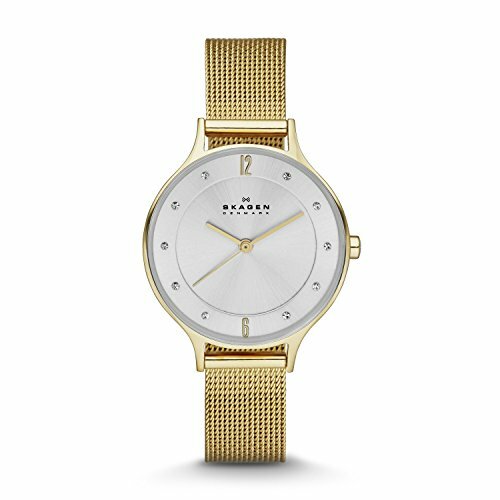 Skagen have certainly not forgotten the ladies, and this slim version of their Ancher range show’s all their design skills in one watch. A clean, no-nonsense dial with crystal hour markers and a thick gold-tone plated bezel and case shout style from the word go. 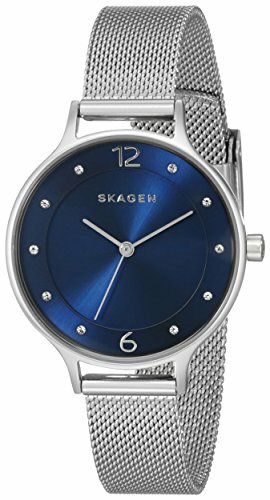 And when combined with the stainless steel mesh bracelet, it is no surprise that this is one of the most popular Skagen’s ladies watches on Amazon. It also comes in a variety of other colors and styles, you can see and click on in the images below. 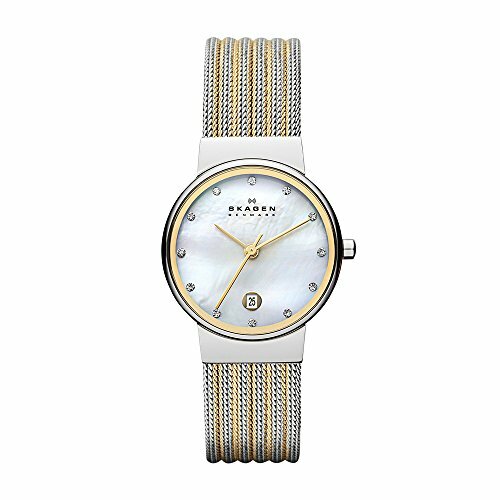 Another stunning watch from Skagen for women. The Anita has a brilliant blue starburst dial with an elevated ring of crystal hour markers. The rest of the dial and hands are simple and minimalistic, as you would expect of Skagen. The thing stainless steel mesh bracelet with the elegant lugs add the final touch to this classy watch that could be both an every day work watch or one you could wear out on the town. 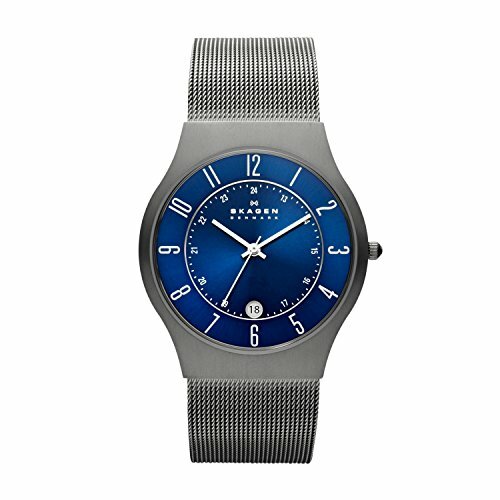 And as with all Skagen collections, there are many and varied models you can choose from. Some of which I have added below.